Blackberry pie recipes are a must as summer turns to autumn. Take advantage of nature's bounty with these easy, delicious recipes. Fresh blackberries are absolutely delicious and not to be missed when the blackberry season is on. And if you have been canny enough to freeze a few blackberries, the season is always here. Blackberries are a super-food in my eyes as they are so rich in nutrition. Blackberries are rich in vitamin C and iron and have useful amounts of thiamin, niacin and folate. But there's no need to just eat them because they are good for you. A dish of fresh cooked blackberries in a pie can hold its own against many another more sophisticated dessert! 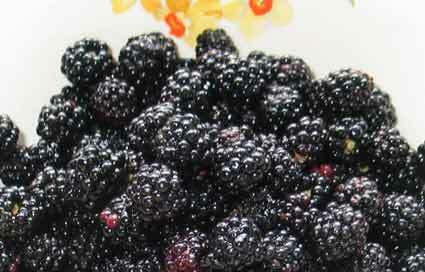 If you cannot find blackberries - or the time to pick them, you can buy them in cans and jars from Amazon. They are doubtless good - but probably do not compete with the wild ones we pick ourselves. Make a shortcrust pastry mix (see Easy apple recipes for a shortcrust pastry recipe) and set it to cool in the fridge or other cool place for half an hour. Wash and clean the blackberries. Leave them to drain for a few minutes in a colander to remove any excess water. I always think it's best to wash blackberries because flies love them so and many track side picking sites are doubtless quite dirty. Roll out about 2/3rds of the pastry and line a pie dish, making sure that there's plenty of edge for the top to attach to. Brush the pastry with a beaten egg and pop it into the oven for around 10 -15 minutes, or until almost cooked. The beaten egg will help prevent the pastry from becoming soggy when the fruit is added. Put the blackberries and any other fruit you have selected into a pan and cook them lightly for 5 minutes, coating them with the sugar and flour. Just sift the flour and sugar onto them and gently turn them to prevent them sticking to the pan. (The purpose of the flour is to thicken the mix just enough to give a reasonably firm texture to the fruit mix. You can leave it out if you don't mind the pie contents being rather runny.) Try not to break the fruit. Switch off the heat. Add a squeeze of fresh lemon juice. Fill the pie dish with the fruit to a generous height and add the pastry topping. Seal the edges with a little brushed milk and pressure from the back of a fork. Brush the top with either the beaten egg or a little milk. Add a thin scattering of sugar if you like. Bake for approximately 15 - 25 minutes in a moderate oven (gas mark 4, 180 Celsius) until the pastry top is cooked. Serve with cream, soured cream or fromage frais. Yogurt is also very good and fresh made hot custard is just straight out of the top drawer! Blackberry pie recipes - the easy get out! This isn't strictly a pie, as it does not involve pastry. But if you've left yourself short of time this is a good alternative. It's a very easy pudding for those long autumn evenings, when you want something quick and comforting to tuck into. This has got to be the simplest hot pudding on the planet, after tapioca! The exact quantities are not crucial; adapt the dish to the fruit you have available. You can use slightly stale bread if you like. Slice the bread fairly thinly. Add a little butter if you like. Cut the bread into suitable strips and line a deep pie dish so that the bread sticks up slightly above the rim of the dish. Cut a round of bread with a sharp knife to fit in the middle at the bottom so that the entire dish is lined with bread. Sprinkle a little sugar around on the bread. Clean and trim the fruit, core and peel the apples. Put all the fruit into a saucepan with enough sugar to sweeten it effectively. Gently cook the fruit for a few minutes until it is a little soft and the juice has run out. Add the fruit mixture to the dish, making sure that most of the bread is soaked in fruit juice. The tips of the bread should remain dry. Scatter a little more sugar on the dish. Put the fruit dish into a medium oven until piping hot and the bread tips have become crisp. Serve with yogurt, ice-cream or cream, or a non-dairy alternative. This is like a hot version of summer pudding. You can also eat it cold, of course. Try adding a few peach or plum segments to the fruit mix as a variation. Most easy blackberry pie recipes such as these above can easily adapted to other fruit such as gooseberries or cherries. Adjust the sugar content to suit the fruit as needed.